Most drunken bar collaborations don’t end up in more than a hangover and a good memory. Jakob Kubizek and Stefan Deisenberger instead broke the mold and used this conduit to produce indie pop beauty Love & Fist. 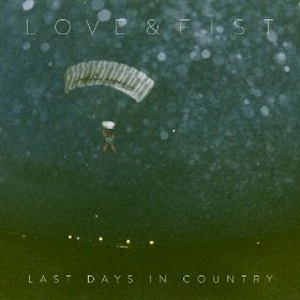 Last Days In Country is an ode to goodbye and hello. The four tracks alternately discuss moving, reinventing one’s self, reuniting with old friends, separations, and new beginnings. These musings are no-nonsense, no games, and no regrets. Instead, the listener is bathed in honest connection through genuine lyrics and thoughtful instrumentation. “If you want to walk, why don’t you walk, and if you want to smile, why don’t you smile?” begs Kubizek on the stand out track, “Wasting My Time.” You know what? Dammit! He’s right! Use this EP as the call to arms that it is; to do what you have to do to evolve your personal happiness. May this EP be the backdrop to your glorious journey.